If you aren’t reading the current mini-series ‘Reign in Hell‘ and ‘Ambush Bug: Year None‘, then you are really missing out! Keith Giffen is firing on all cylinders right now. ‘Reign in Hell’ covers a war between two factions for control of Hell. Blaze and Satanus have become the rulers of Purgatory and lead a rebellion against Hell by offering “hope to the hopeless”. 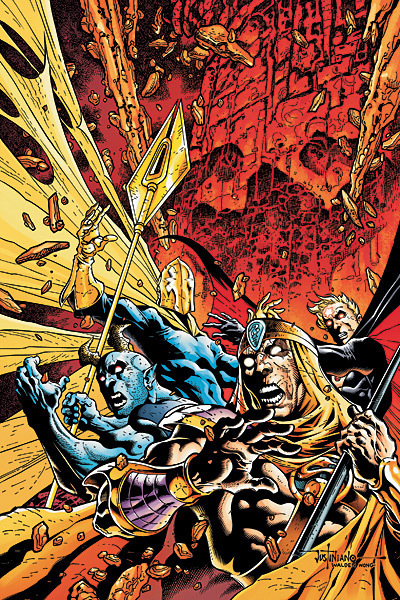 They are opposed by Neron, and other demonic characters from the DCU. Some of the main characters featured in the story include: Zatanna, Blue Devil, Doctor Fate, Black Alice, Ibis the Invincible, Sargon the Sorcerer, Zauriel, Doctor Occult, Etrigan, and at least one other surprise MAN who plays a MAIN role. 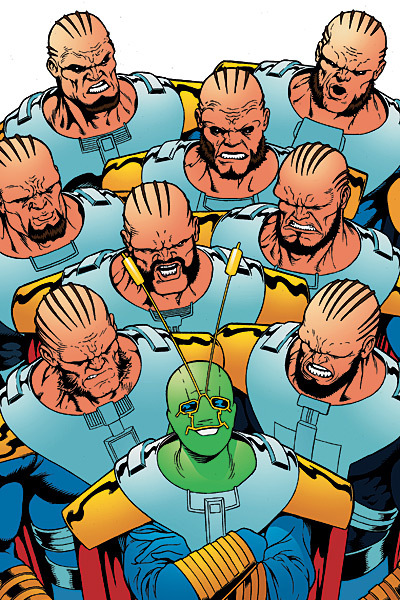 ‘Ambush Bug: Year None’ is a brilliant parody that covers one recent major DC event per issue. Across the six issues they are tackling: Identity Crisis, Countdown to Infinite Crisis, Infinite Crisis, 52, Countdown to Final Crisis, and Final Crisis. This is lots of fun! It can be enjoyed by someone who has never read an Ambush Bug comic or a long-time fan. Definitely worth your time. Keith Giffen is writing both these books, and penciling the Ambush Bug title. It sort of feels like the late-1980s/early-1990s again with Giffen working on characters such as Ambush Bug, Doctor Fate, and this certain MAN who plays a MAIN role in ‘Reign in Hell’. Am I being too vague? I’m looking at you SGhoul. ‘Ambush Bug: Year None’ issue #5 and ‘Reign in Hell’ issue #6 are scheduled for December, but I’m sure you can pick up the previous issues at your local comic shop. Check them out! In last week’s episode of Chuck, Morgan was reading an Ambush Bug comic. It was in the scene where the Sensei, Carl Lumbly, aka Martian Manhunter from Justice League, talks to Morgan in the Buy More.